Recently, Porsche claimed that its new Panamera Turbo was the fastest sedan around the Nurburgring. Sadly, that title lasted only for a few months. 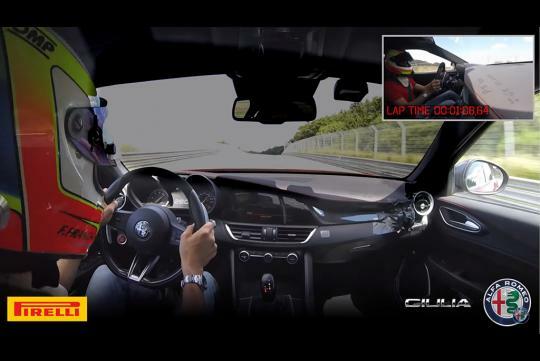 Alfa Romeo's Giulia Quadrifoglio has reclaimed that title with a lap time of 7 minutes and 32 seconds. Italian racer Fabio Francia piloted the car through the course with its optional eight-speed automatic transmission, rather than the six-speed manual. Looking at the video, it's obvious that he pushed the sports sedan to its absolute limits with constant correction to the steering wheel in corners and riding of the curbs. Thanks to its turbocharged 3.0-litre V6 that makes 503bhp, the car can be seen hitting 280km/h on the long straight at the end of the video.